Here is a Visio stencil containing 118 shapes for vCenter Orchestrator (vCO) that I put together. It contains basic workflow shapes (start, decision, etc.) 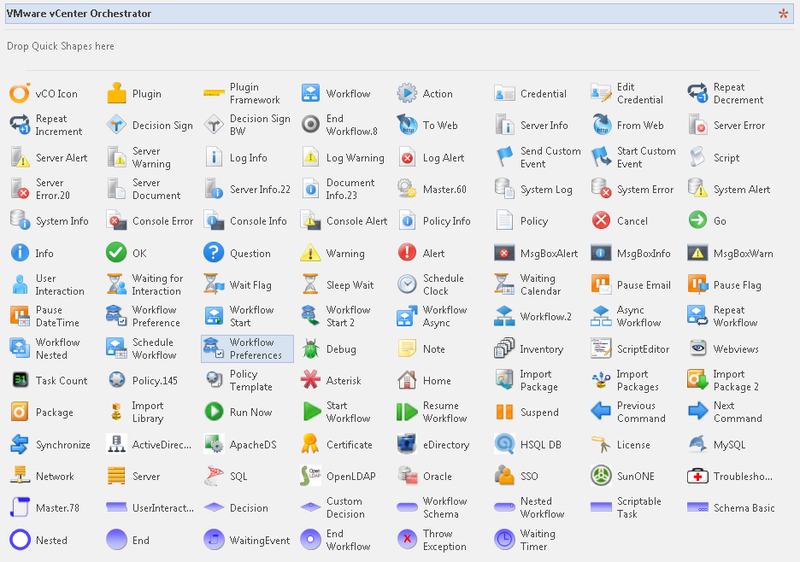 as well as other shapes such as directory services, credentials, nested workflows, policies, custom actions and other product specific icons. If you are mocking up some Orchestrator workflows to automate processes in your virtual data center, these shapes should give you the ability to provide a graphical representation of your ideas to share with your team. This stencil joins my other Visio stencils for VMware Horizon View and other generic VMware Visio stencils and resources – see here for the others. Let me know if you have ideas for other shapes in this stencil or have ideas for improvements! Note that this is not an official VMware release and is not supported by VMware – it’s just a little something I did in my spare time over a cold beer. Cheers!